The concerts are FREE, but a ticket is required for admission. Watch for more information about when and where to get tickets. The Tellico Village Singers was formed in March 2017 and is a choir composed of residents from Tellico Village and surrounding areas. We have a common love of music and perform all types of secular music. Since inception, the TV Singers has become a regionally recognized performing ensemble – growing from an initial 25 voices to over 100 enthusiastic performers. The choir is enhanced by one principal and two additional accompanists. In 2018, we became a 501(c)(3) corporation so that dues and contributions are tax deductible. The Tellico Village Singers and Tellico Voices are fortunate to be directed by Dennis Loy, a professional choir director who retired to Tellico Village in the fall of 2016. The Tellico Voices is a small ensemble of Tellico Village Singers who love to perform all genres of music, especially arrangements with intricate harmonies and rhythms. Their repertoire includes favorites from the various ages, love songs, Broadway tunes, jazz and rock. For more information, including how to book the Tellico Village Singers and the Tellico Voices, contact Jan Sampson (phone: 630-207-1040 or email: [email protected]). Our concert dates and locations are posted on the TellicoLife calendar under Social Clubs and abbreviation TVSingers. Thank you Tellico Community Foundation! In May 2018, Tellico Village Singers is the grateful recipient of a $500 grant from the Tellico Community Foundation Fund, an affiliate fund of the East Tennessee Foundation. This grant is provided to support our Community Concerts. For more information on the Tellico Community Foundation, please visit the TCF home page on TellicoLife and the East Tennessee Foundation's website (www.easttennesseefoundation.org). TV Singers use our TellicoLife Circle to communicate with other members about our club, and to discuss all matters related to music and our love of music. The Tellico Village Singers rehearse Mondays at 2:30-4:30 p.m. in the First Baptist Church of Tellico Village choir room. For more information, including how to join our choir, contact Jan Sampson (phone: 630-207-1040 or email: [email protected]). Dennis Loy married Kathy on January 4, 1975. Has undergraduate and graduate music degrees (with vocal/piano emphasis) and conducted in Wisconsin for ten years with high school Show Choirs, Men’s Choirs, Women’s Choirs, Madrigal Singers, Mixed General Choirs, Select Mixed Choirs, directed yearly musicals, with Choirs cut a record with Delta Records, served as regional and state music judge. Moved in 1981 to the East and served as Executive Director and Conductor-in-Residence with a burgeoning New York City Production Company; helped the company bring singers from across the US and the world to perform in Carnegie Hall, Lincoln Center’s Avery Fisher Hall, and important music venues both in NYC and abroad. Had his NYC debut conducting John Rutter’s Requiem; was Tour and Music Coordinator with international touring choirs, traveling to (among other destinations) Russia, Spain, and Italy. Coordinated and was Assistant Director at a yearly summer Greek Festival in Syros, Greece. Retired and moved to Tellico Village in the fall of 2016. Presently directs the Tellico Village Singers and the Tellico Voices and is Vice President of the Tellico Community Players, working in various capacities with that artistic Tellico Village organization. On Feb. 2, 2017, a participant in the Tellico New Villagers meeting asked if there were any community choirs to join. That initial question led to a February 6 meeting at the Yacht Club chaired by Ellen Fox (TNV Social Chair), where nine villagers interested in forming such a choir met and introduced themselves/their backgrounds. During that meeting, Jan Sampson emerged as point person for development of a TV community choir, and Dennis Loy volunteered his choral conducting experience to assist in its development. Dennis was soon asked to be director of the Tellico Village Singers. On Feb. 20, twelve people pursued this choral idea, and Jan volunteered to ask Tellico Village’s First Baptist Church if the singers could use its choir room for rehearsals. From that point, The Tellico Village Singers was a reality. To promote interest,Tellico Village’s Channel 3 and The Connection provided information to all of Tellico Village. Forty people made up the first Feb. 27 rehearsal. A day later, the first of two donations was made by our Music Angel, in memory of her mother who with her family had loved music. The TV Singers’ music library was thus established, ensuring that the TV Singers could legally obtain all music. With further interest provided by Channel 3, The Connection, and tables at The New Villagers/HOA meetings, the email list for the TV Singers soared to more than 100 people. The Roane Choral Society provided the needed Constitution and By-Laws. 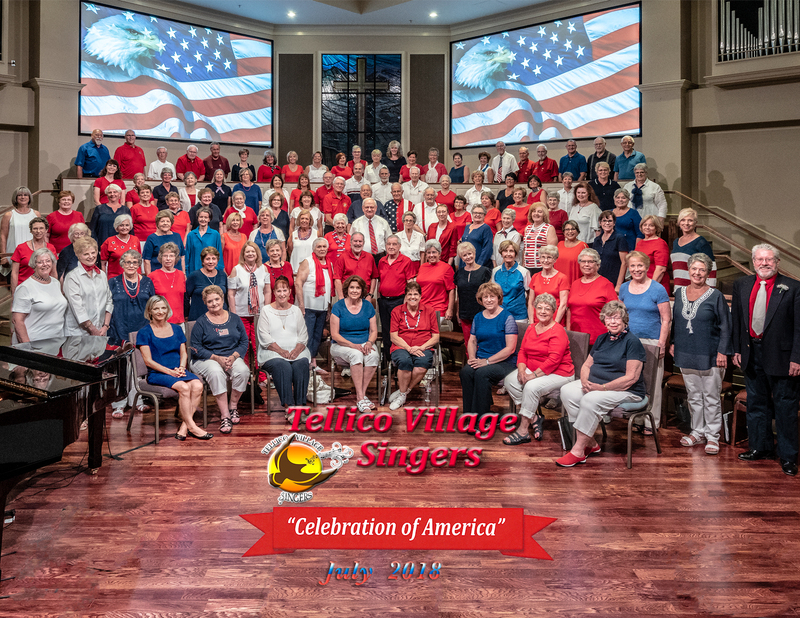 The Tellico Village Singers has performed to overflow crowds at patriotic concerts in July 2017 and July 2018 at the First Baptist Church of Tellico Village, and at March 2018 and March 2019 concerts at the Community Church of Tellico Village. In addition, the TV Singers also performed at other events such as Music In The Park in Madisonville, the Kahite Fourth of July parade, and Christmas events throughout Tellico Village. The Tellico Voices were honored to be asked to sing the national anthem at the Smoky Mountain Service Dogs organization’s Passing of the Leash ceremony in March 2019. The group also sang the national anthem at a Tennessee Smokies baseball game during opening weekend in April 2019. They have performed for events sponsored by the local American Legion post and by Adult Community Training (ACT). The ensemble presented an evening of entertainment at a combined anniversary/birthday celebration at The Venue in Lenoir City in August 2018.